Dr Tom Peters shared insights from his book, In Search of Excellence. 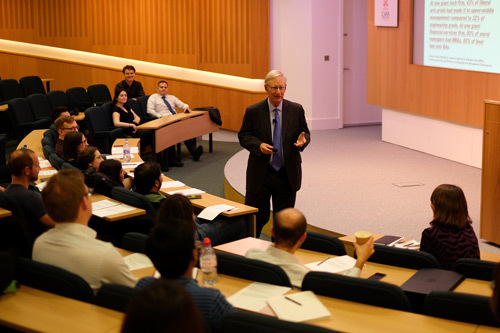 Cass Business School was delighted to welcome the renowned business management leader Dr Tom Peters, who gave an exclusive masterclass to MBA students. Dr Peters, who is the co-author of the popular management guide In Search of Excellence, spoke to students about the importance of pursuing excellence in management practice, the importance of a strong business culture and his core belief that joy should be at the centre of the workplace. He also shared with students some of the key lessons that he has learned during his long and distinguished career which has spanned service in the Vietnam War, an advisory role in the Nixon administration, time as a Partner at McKinsey and also as an independent consultant. Dr Peters said he was pleased to be able to visit Cass and meet the MBA cohort and teaching staff. “I’ve enjoyed meeting the Cass students today – these are real people, studying real subjects, in the real world. They are here because they want to be here and that is very inspiring,” he said. 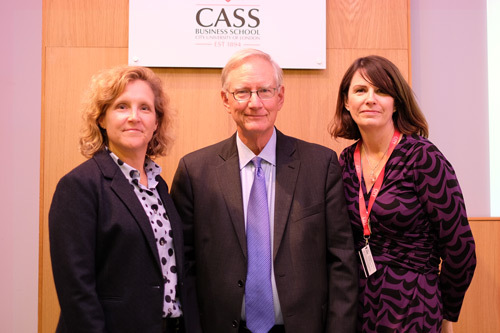 Dr Sionade Robinson, Head of MBA Programmes, said Cass was honoured that Dr Peters chose to visit Cass and share his insights with the MBA cohort. “I first heard Tom speak at the start of my career and his words of wisdom are just as relevant now as they were then. We are delighted that he was able to join us - it is a wonderful opportunity for our MBA students to learn from a management practice legend,” she said. Dr Peters is currently writing a new book, based on his ExcellenceNow.com presentation. It will cover a diverse range of topics including women and leadership, SMEs, technology, branding and strategy. “I intend the book to spur business people to action by framing timeless business truths in the current turbulent times,” he said.